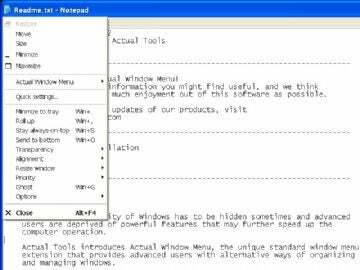 Actual Window Menu gives you one drop-down menu from which to control your windows in various ways. You can minimize them to the system tray, determine execution priority, keep them always on top (or bottom), apply transparency, and more. This little tool is identical in functionality to its sibling product, Actual Title Buttons, except that the functions are accessible from a drop-down menu added to the application icon in each window's title bar. You can create rules for each application, as in all other Actual Tools programs, and the interface is the same. This program worked fine during testing, without any unfortunate bugs (as I encountered with Actual Window Rollup). If you hanker for one-click access to control how your windows display and behave, then give Actual Window Menu a try.